I have got some really exciting news to share with you. I activated my BTC robot for trading today, 23 Aug 2013 at about 7pm. And now after about 5 hours, I have made a profit of US$2.61 from my initial investment of US$112.61. Not bad for a start since I did not even carry out any trades manually. Want to buy the robot? Please click here. Note that the robot is projected to make 5% to 100% return on your investment every month. Therefore, if your profit margin is within that range, it means that the robot works. I have decided to change my frequency of updates from Weekly to Monthly to facilitate the profit margin calculation to avoid confusion among my readers. Most importantly, it will allow me to do a more accurate comparison between my performance and the btc robot development team’s prediction of 5% to 100% return on a monthly basis. I have verified with the Platinum Support team and they have told me that the live account with the best results is on Aggressive mode. Hence for people who have not been getting results with your BTC robot, you may want to switch your setting from other settings to Aggressive instead. Update Week 1 (23 Aug 13 to 30 Aug 2013) : I have made US$12.19 from my initial investment of US$112.61. About 10% return on investment. You can view my complete update here. Update Week 2 (31 Aug 13 to 6 Sep 2013) : I made a loss of US$1.68 due to some technical error with the robot. Overall profit stands at US$10.51. About 8% to 9% return on my initial investment. Do note that I have increased my capital to US$132.61. You can view the full details here. 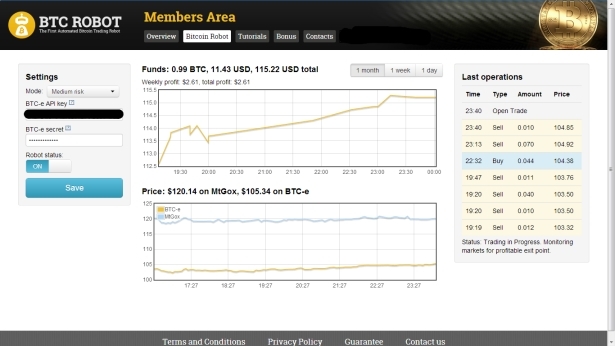 Update Week 3 (7 Sep 2013 to 13 Sep 2013) : I have topped up an extra US$200 to my BTC-e account. Hence, my capital investment is now US$332.61. My overall profit stands at US$19.94. Therefore, my overall return on investment is about 6%. See my full story here. Check out the complete details here. Update Week 5 (21 Sep 2013 to 27 Sep 2013) : I made a profit of US$2.01. Hence, my overall profit stands at US$15.72, about 4.7% return on investment. (Very close to the 5% return which the btc robot development team projected in a month). Click here for the complete details. Update Week 6 (28 Sep 2013 to 4 Oct 2013) : I have topped up my btc-e account with an additional US$172 on 30 Sep 2013. That brings my total capital investment to US$504.61. I made a loss of US$7.39 for this week due to a special event which took place on 2 Oct 2013. Therefore, my overall profit stands at US$8.33, about 1.65% return on my total investment. Update Week 7 (5 Oct 2013 to 11 Oct 2013) : I made a profit of US$2.48 for this week. My overall profit stands at US$10.51, which is about 2.08% return on my overall investment. This is a slight improvement of 0.43% from last week. Update Week 8 (12 Oct 2013 to 18 Oct 2013) : I made a loss of US$4.12 for this week. My overall profit stands at US$6.69, which is about 1.3% return on my overall investment. Be sure to view my post for the full story because I have got some valuable insights to share with you. Click here to view my Aggressive results in greater detail. I made a total profit of US$139.08 for this month, about 26.59% return on my investment for the month. This is still within the projected monthly return of 5 to 100% by the BTC robot development team. Click here for the complete story! I made a loss of US$2004.57 due to extreme changes in bitcoin prices for the month of Dec 2013. Be sure to read my complete post to find out why this happened and my findings about the ability of this robot. I made a profit of US$4.54 for the month of Jan 2014, about 0.35% return on investment. I am making a slight loss of US$86.18 for the month of Feb 2014, about – 6.77% return on investment. Visit this link for the complete story! I am making a loss of – US$403.89 for this month, about – 34.01% return on my investment. Read this post for the complete story! To Your Bitcoin Trading Success! I am very interested but is this real or you just sell your robots? Thanks. I have emailed you on this matter. How is the robot going now in aggressive mode for November? I am up by 116% profit as of today, 24 Nov 11.10 am (GMT + 8) for this month. I have sent you the screen shot of my results. I will be doing a complete update for the month at the end of this month. First of all congrats for your well made blog. I still quite skeptical about the functioning of the robot, can you please give me some updates about the latest results? I have sent you a screen shot of my results. I am up by 116% for this month. Been using the bot for about 4 days now, up 5% or so. With the wild ride the BTC market has been on the last 24 hours, my bot has been silent no trades in the last 18 hours. Strange, no? Have you noticed long periods of inactivity like this in your month of trading? I’ve emailed support on this and they claim its normal, but doesn’t seem normal to me. Great site, look forward to your updates! After I review your video and some infos about the BTC Robot, I like it very much, but some of my Chinese friends asked me to translate it, I wonder if you have a Chinese site or if I can help you to translate it into chinese and make a Chinese site or video, I know there are a lot of Chinese want to learn from you. I have emailed you the results. Can u show me your result. How much u are making profit last month? Interesting blog. However, you better monitor how many BTC’s profit you did rather than in US$. That figure is not correct. If you have started with lets say 10 BTC and now have 12.5 BTC, than you have made a profit of 2.5 BTC. All other values are worthless in my opinion as it has the growth (or loss) included which doesn’t come from the robot. If you did a 100% growth over the last month, thats also what the BTC increased on the market, without a robot. I have been using this robot for the past few months. Don’t you think I am aware of this? However, you are considering only one side of the story. You haven’t considered the falls and turbulence in the marketplace. Those are great opportunities to grow your capital and the robot is getting better at it. I consider both market movements and the robot results. As per your overviews it’s totally unclear what the robot did for you and what the market did (huge up in November). That’s why my suggestion is to display the results in BTC rather than US$ as this includes the markets moves. The equivalent of BTC can than be calculated in US$. I had a similar result as you last month (not taking into account the price differences between the 2 major exchanges though) but more because the BTC price went up; the robot didn’t really contribute to it in my case (yes, I use the robot as well). Did you delete my post? I can not see my previous posting any more.. Anyway, If you’re pretty sure about performing your robot in the market, why don’t you input some fortune and enjoy your life? If you have some concerns, you should share that also. I am putting aside a fixed portion of my income every month to be placed in the robot because I need to use the remaining income to look after my family. I can’t possibly put all my money in the robot. You still need to have some emergency funds for other matters. It is basic financial planning. Je velmi snadné použití. Pokud potřebujete pomoci nastavit, mohu vám pomoci. Can you please tell me how the robot has been performing this past few weeks for you? I have emailed you on that matter. BTC crashed many times since 25/11/2013, does BTC robot still survice? I think the robot can only make profit when the BTC price go up, and vice versa. Im I correct? If possible, can you please send me the BTC robot performence from 20/11/2013 up to now? I have sent you the results. Can you send me robot results? Thank you. I have sent you via email. Can you please email me details of your December 2013 BTC robot performance. What do you think of running a long term six sigma study along with your case study? suggesting aggressive action. Six sigms helps avoid it like a real time beacon that guides you, to make decisons on best practices. It makes numerical decison based systems maker avoid human pitfalls. This can be a first global study of its kind. Let me know if you are interested. Hey can you please email me your December BTC robot trading update.. I am curious how it played out the December bitcoin crash. BTW i dont own any bitcoins. but just before i go and sign in for the membership, i would like to have a look on some recent results that you got. Thank you, and keep it up. I have sent you an email for the results. happy new year and thank you for bringing up your results on this homepage. I am monitorng your monthly reports and i am very intersted in your results. Your December results are a little bis dissapointing. I wonder if a simple hold strategy wouldnt be better? Did you made the math about it? I am trading with the robot since mid december and missed the huge drop. So far the robot is doing well but i dont know if another deep drop will eat all profits like in your case. Fine blog and thanks again for your effort. Although the buy and hold strategy is currently better than using the robot, it also depends on market conditions. If the price of bitcoin drops to a hundred dollars, you will get to save more of your initial investment with the robot compared to the buy and hold strategy. This is assuming if you bought bitcoins when it was at a high last month. If you like we can compare our results via email. I have 2 questions, I would be really grateful if you can answer them for me. 1 – Can the “Gold Plan” be upgraded to the “Platinum Plan” ? 2 – How can your December earnings provide a loss when this was the month that made many millionaires ? you started off with almost 1 Bitcoin valued around $30. if u kept that and sold on your own for about $1,000 then that would be a lot better than over $2,000 loss. What other factors caused this ? you mentioned the issue with the Chinese government but this is no excuse for the robot, everyone else got rich. The value sky rocketed back up because of its validity. This has me completely reluctant to join. Can offer as much light on this as possible ? 2. If you read my post carefully, there was a drastic drop in bitcoin price from US$1100+ to US$400 within a week or so in the mid of Dec 2013. Hence, it is pretty obvious that I will suffer a loss in trading with such drastic change in prices within a short time frame. Most importantly, you cannot judge a robot’s trading performance based on a month alone. I started off when the price of bitcoin is about US$120, not US$30. Besides, I increased my capital over a period of 4 months, not at the start when the price of bitcoin is at US$100+. Therefore, there are bound to be a lot of fluctuations in my profits. Please read my updates again. seemed to me that your initial week 1 (August) showed a little less than 1 btw @ around $30/btc. that is what i was referring to when i said u started off at that value. r u therefore referring to the beginning of December alone when u say u started off at $120 ? I am new to all this so this is why i cannot compute all the figures i guess. Anyway i guess i will think about it some more. I signed up for the Platinum plan by clicking on your link on this website. u mentioned in one of your youtube videos that affiliates will receive 0.1 btc. after the 60 day trial. does this still stand ? how will this be communicated and achieved ? One more thing, the btcrobot guide says that the robots can provide from 5 to 100% profits each month. I am not only considering money in BTCe but the cost of the robot as well ($498). Therefore one should start off with at least this amount in Bitcoin and US to make back ones investment soon. what r your thoughts on this ? One last thing, I make a booboo, not sure how big a booboo, but i traded litecoins i had on BTCe into Bitcoins for the robot to use, but this was done after i set up everything, only to read in their guide that manual trading would confuse the robot and they strongly advise against this. Have u had any such problems ? Great youtube videos BTW !!! Answers to your questions in bold. 1. seemed to me that your initial week 1 (August) showed a little less than 1 btw @ around $30/btc. that is what i was referring to when i said u started off at that value. r u therefore referring to the beginning of December alone when u say u started off at $120? The price of 1 bitcoin in Aug when I started out is already US$100+ if you refer to the price chart at btc-e.
2. I signed up for the Platinum plan by clicking on your link on this website. u mentioned in one of your youtube videos that affiliates will receive 0.1 btc. after the 60 day trial. does this still stand ? how will this be communicated and achieved ? I don’t think you bought the Platinum plan, you only bought the Silver one. Anyway, the bonus is no longer available. I have removed it from my website in Nov 2013. 3. One more thing, the btcrobot guide says that the robots can provide from 5 to 100% profits each month. I am not only considering money in BTCe but the cost of the robot as well ($498). Therefore one should start off with at least this amount in Bitcoin and US to make back ones investment soon. what r your thoughts on this ? The support team recommends one to start with US$500 and above. 4. One last thing, I make a booboo, not sure how big a booboo, but i traded litecoins i had on BTCe into Bitcoins for the robot to use, but this was done after i set up everything, only to read in their guide that manual trading would confuse the robot and they strongly advise against this. Have u had any such problems ? It shouldn’t be a problem if you are not trading bitcoins to other currencies. Do update the support team to make some changes to your portfolio value by dropping them an email. Hi Jonathan, been fascinating following your progress but I think you should be reporting your profit in bitcoins. I bought 3 bitcoins when they were $100 each, I still have 3 that are worth about $2,400 but I don’t consider that profit, I did nothing. Maybe you have provided this information already but I’d be interested in your bitcoin profits not US$ profit. The purpose of the bitcoin robot is to maximize your profit in terms of USD. That is totally wrong. The correct way to assess progress of Bitcoin Robot (clue is in the name!) is how much profit in terms of BTCs it is making. Assessing profit in USD is merely assessing the movement of the market price. Sadly there is no evidence anywhere that I have seen that shows anyone has made a profit in BTCs with the robot (just lost BTCs!) – if this is not correct then just place the evidence here! I will verify with the support team with regards to the main purpose of BTC robot and put it here.